The best advice I can offer at this stage of the project is to be patient with the amount of paint you put on your brush. Get as much excess as possible back into the bucket! 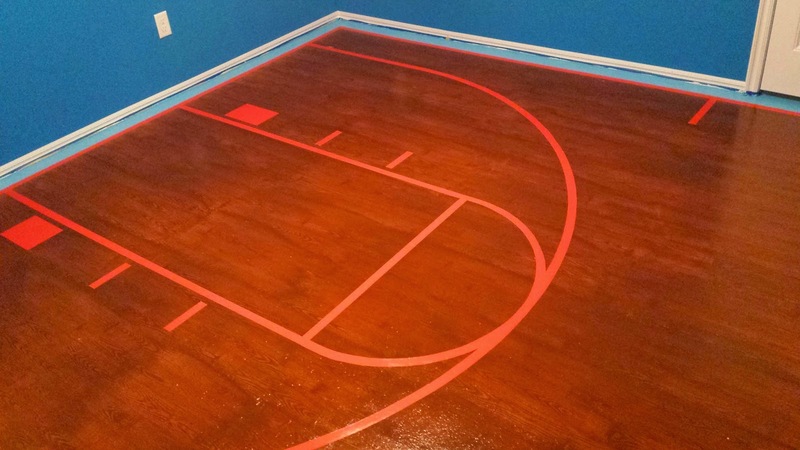 Your free-throw arcs and 3-point lines consist of a couple hundred 2-3 inch overlapping pieces of tape. Albeit microscopic, each one of these overlaps creates a small gap where paint can possibly seep in. It's very easy to get a little over-anxious with the end in sight, but keep that brush mostly dry...too much excess will get under these gaps and create imperfections in your lines. 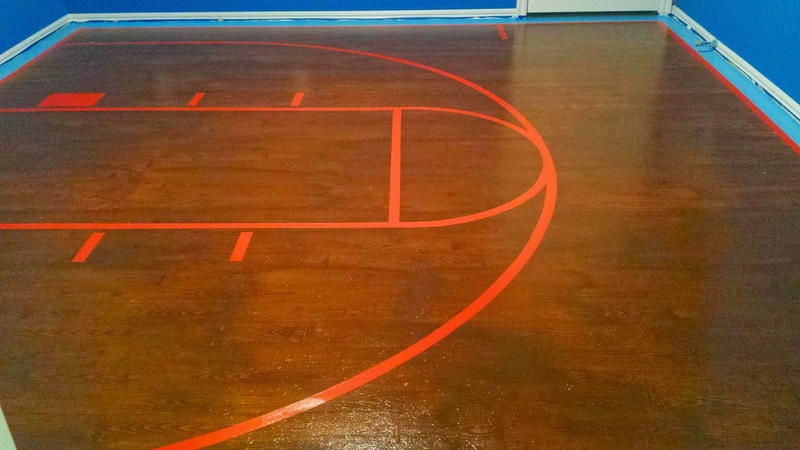 Another thing to consider, if you're doing the court like we did...we're painting a very light orange color over a very dark oil-based stain. Even though I thought it would take 2-3 coats of paint to cover, I think in the end it took 5...which emphasizes my prior point even more...in doing these lines, less is truly more. So don't over-soak those brushes, and take your time...it'll pay off! Here's our finished product, after removing all the tape from the floor. We think the lines turned out fantastic! And here's another angle, taken at a different time of day. The sun really seems to create quite a difference in contrast with the stain color and court lines. And we're so close!! Next we'll color in the 'paint' section (Free Throw Box) and add a logo and decals. Stay with us and see the final result!